Finally back to my own kitchen! (Kind of, I share it with 5 other girls). I'm glad to be back at school and back in my own routine. I really missed having a kitchen this summer and since I've gotten back to my kitchen I'm able to cook healthier meals. The meal I had been craving all summer was this Summer Garden Pasta. It's light and tasty and can easily be made organic. I enjoyed this meal on my new porch with my boyfriend Matt. 1. Slice cherry tomatoes in half and combine with olive oil, garlic, basil, red pepper flakes, salt and pepper to taste. Cover with plastic wrap and set aside at room temperature for 4 fours. I recommend making the sauce at least 2 hours ahead of time so that they flavors have time to marinate. 2. When ready to serve, cook angel hair pasta according to directions. Drain pasta and add to the bowl of cherry tomatoes. Top with any more basil you want and the freshly grated parmesan and serve. *This recipe is from Ina Garten's Barefoot Contessa at Home book. 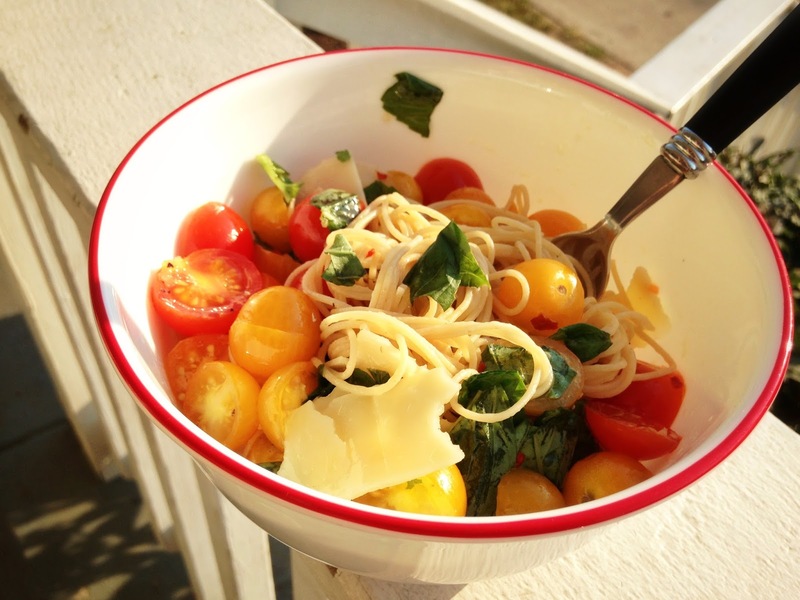 It happens to be one of my favorite pastas and the perfect summer recipe so I had to share. Unlike many of my other recipes, I haven't changed this one very much except for cutting the recipe in half.